Who knew that February 24, 2009 would offer up so many reasons to celebrate? Per my blog archives, I’ve made it quite clear that I am a sweet potato fanatic and would gladly eat them every day, so I think that any day in February, a.k.a. National Sweet Potato month, is worthy of a party. The 24th, however, goes above and beyond by being not only International Pancake Day but Mardi Gras as well. Laissez les bons temps rouler indeed! Today’s recipe was inspired by this trifecta of foodie-friendly festivities. Instead of singling out just one, I decided to combine all three in a Bourbon Street meets North Carolina meets….um…I guess IHOP type of dish. Other than traditional holiday pies, people generally don’t tend to think of using sweet potatoes in their desserts or breakfast treats. In reality, sweet potatoes are the perfect ingredient for these sorts of dishes. Take these pancakes, for example. Sweet potatoes contribute a natural sweetness (thus the name), a moist texture, and a pretty orange hue. Sweet potatoes are also a fantastic way to sneak all sorts of nutritious things like potassium, beta carotene, iron, and fiber into your family’s breakfast. Don’t worry–your secret is safe with me! If you have time, bake the sweet potato at 400F degrees for about 1 hour. Prior to baking, prick it several times with a fork and wrap it in foil. If you are short on time, you can microwave the sweet potato for 10-12 minutes, turning once. To keep the sweet potato from drying out in the microwave, wrap it in a piece of paper towel so that it gets “steamed” during the microwave process. I find that the easiest way to get a smooth sweet potato puree is to use a mini chopper or a food processor. Sometime using a potato masher leaves lumps or strands. If you are making several batches of these pancakes and want to serve them all at once, place the prepared pancakes on a baking sheet and keep them warm in a 200F degree oven. If you don’t want to use rum in your recipe, you can substitute vanilla extract. In a large bowl, whisk together the flour, whole wheat flour, baking soda, baking powder, cinnamon, ginger, nutmeg, cloves, and salt. In a medium bowl, mix together the buttermilk, sweet potato puree, egg yolks, brown sugar, melted butter, and rum. Add the wet ingredients to the dry ingredients, mixing until just combined. In a clean medium bowl, beat the egg whites until soft peaks form. Gently fold the egg whites into the pancake batter. Fold in the chopped pecans. Spray a griddle or a large skillet with nonstick cooking spray and place over medium heat. Working in batches, pour the batter by 1/3-cupfuls onto the griddle. Cook the pancakes until bubbles start to form on top, about 2 minutes. Carefully turn the pancakes over and cook until the bottoms are golden brown, 1-2 minutes more. 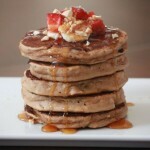 Transfer the pancakes to plates and serve with pure maple syrup and a sprinkle of pecans. seems like a great recipe, i guess you could do the same with pumpkin also? I’m not a pancake person, but I love sweet potatoes… these really look good! The second we saw this, it brought us back to a version we made in Nov: http://duodishes.wordpress.com/2008/11/27/happy-thanksgiving-pancakeshappy-thanksgiving-pancakes/ We cheated a little bit though. Yours sound so good! Nice touch with the rum. We love sweet potatoes too. We can’t tell you how many recipes we’ve used them in. The title of this post totally sucked me in! I love the sound of the ingredients used and the pictures look so yummy! These look completely decadent – putting them on the list to try! Sounds excellent, never had sweet potato pancakes but I can see the appeal. I meant to post pancakes today too given the occasion, didn’t get around to it but I did eat one! These pancakes sound so delicious! It’s a great use of sweet potatoes too. And, rum in my pancakes? Love it. Ohhhh how my family will love this!! praline & sweet potatoes are a “staple” here in the South! thanks! Oh, wow. Those look fantastic. I am definitely going to try this one. Your pancakes look PHENOMENAL. You did great on pancake day. Those look wonderful. And they’re sweet potato, so they’re healthy, right? When using vanilla in place of rum,do you use the same amount of vanilla as rum. 1TBL. Thanks for stopping by Peanut Butter and Julie! Click here to learn more about me. What kind of food does Peanut Butter and Julie have in store for you? Well, honestly, a little bit of everything. I like to describe myself as “A self-taught cook and baker, who loves to produce food that is unique yet approachable, using only the best ingredients in my made-from-scratch creations.” I don’t really make anything that is over-the-top fancy, although as a serial restaurant patron, I am more than happy to eat and critique anything over-the-top fancy. Rather, I like to take dishes that may be more of a celebrity chef’s speed, use them as inspiration for flavors, and bring them down to a “Hey! I can do that!” level. Sound good? Great, read on!